This is a joint bottling between an independent bottler, The Duchess in Holland and myself for the first time. 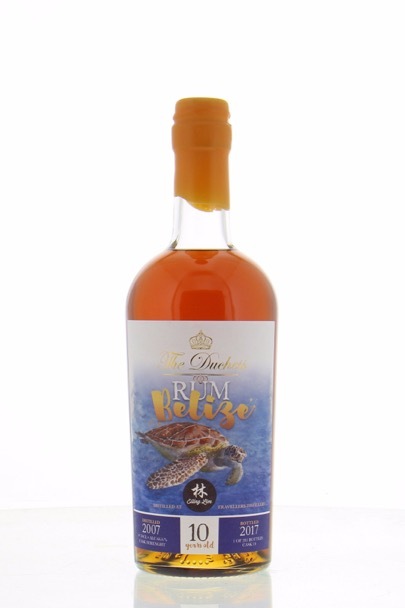 We received many samples of rum from many different distilleries but this particular rum stood out from the rest. From its aroma to its finishing, this is truly one of the best rum I’ve tasted at cask strength. The Travellers Distillery in Belize began distilling in the year 1953 and today, they employ high-test molasses with natural fermentation in their rum production, coupled with a double-distillation method resulting in a smooth finish product. On the nose, you’ll get notes of butterscotch, caramel, cassonade sugar, eucalyptus, menthol, leather, and hints of espresso, syrup from Liège and a whiff of pinetree. On the palate, I tasted a dry and sweet combination of molasses and caramel, creme brûlée, cherries and espresso. The finish is extremely long, warming, smooth and well-balanced. If you are a cigar aficionado, this is the perfect rum to sip while enjoying a smoke. The dry and sweet notes compliments the smoky, nutty and chocolatey taste of a cigar. And if you are a whisky lover, you’ll discover the same enjoyable complexity of flavours and layers of notes in this rum with a hint of molasses sweetness. Don’t let the Devil’s number on the alcohol percentage scare you away. At 66.6%, this rum drinks perfectly neat or according to one individual’s whim and fancy, some addition of water does no harm. 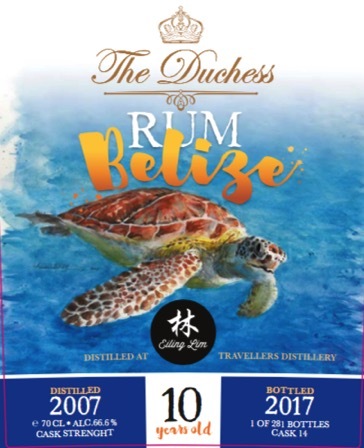 A versatile and fantastic rum not to be missed! For the very 1st time, a very beautiful sherry whisky will be introduced in the classic range of my whisky releases. It was a lucky encounter that we came across this wonderful 19-year-old Glenrothes distilled 1997 and bottled 2016 (50.2% abv, 201 bottles only) matured in a first-filled Pedro Ximenez sherry cask. 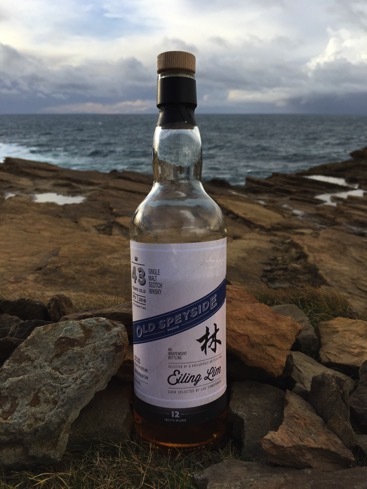 Together with a few whisky enthusiast friends, we tasted this whisky in different parts of the world before we decide to bottle it as my 13th Release. Do allow the whisky to open up in the glass before taking a sip. Thanks to Dirk.V for helping with the notes! On a personal note, I have not tried many Glenrothes that has impressed me as much as this one and therefore I have decided to bottle it and share with all whisky lovers who felt the same as I do. Tasting whisky is like a journey and you will never know what you might find in a bottle. And with this release, I found that I have renewed my passion for Glenrothes. Bessie’s Dram might sound like a feminine name for a bottling but she is no ordinary woman. Named after Bessie Williamson, being the first woman to manage a Scotch whisky distillery during the 20th century and former owner of the Laphroaig distillery, I think I don’t have to mention the origins of this whisky bottling. It was another whisky which I chanced upon a few months ago which made my day. The fact that I could not mention the name of the distillery is not going to stop me from bottling it in my NAS whisky label range which after all they are meant solely to be opened, shared and enjoyed. Nose: simple, and simply right, a high-end distillate. Clean phenolic smoke, with a pear sweetness behind it, almost mezcal if not for the beach sand, oysters, saltwater and such. Not as medicinal as the double-digit expressions. Lemons and mint. Mouth: more mezcal character. Warm and slightly acrid smoke, phenols, seawater. Less sweet than expected, given its youth. Some burnt grass, ginger, lemon. Quite vibrant. Brine and smoke really, with some earthy notes in the end. Tennessee Whisky seems to be popping up for quite sometime now and I haven’t really paid attention to the American whisky scene until recently. Luc & I tried a very interesting bourbon when we were choosing our next cask of whisky and we decided to launch them together with the Bessie’s Dram. The Tennessee Whisky is spelt without an ”e” because this distillery by the name of George-Dickel believes that their whisky are of high quality and can be compared to the Scotch whisky. I’m still impressed. Nose: nice honey and oranges at first, with bright spearmint. Nicely fat, syrupy notes, then also hints of bread. Lots of vanilla marshmallows. Cherries and sultanas. After a while there’s also a highly refreshing citrusy side, say lemon pie. Mouth: sweet, with some fruity notes before it goes towards more wood (pencil shavings) and Seville oranges. Dark cocoa powder. Ginger. Hints of eucalyptus tea as well. Deeply charred wood. Finish: fairly long, with bittersweet notes, mint and some charred touches. A year ago, I introduced an Older Than Old Blended Malt bottling which contains malt from the 70’s, 80’s and 90’s. Many were sceptical about trying a blended malt as most people have a negative opinion towards anything that was labeled “blended”. However, with time many customers have returned and ordered their 2nd, 3rd and 4th bottle of the same whisky. 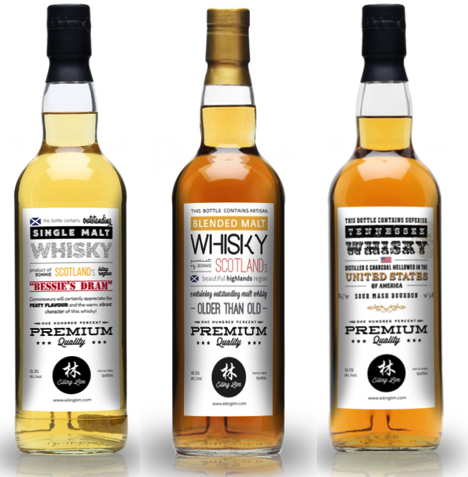 I’m taking this chance to include the Older than Old Blended Malt together with my other 2 NEW releases in this introduction. Nose: aromatic sherry up front. Fruity (oranges, apricots, plums) with light savoury touches and a pleasant acidity. A little Earl Grey and linseed oil. Chocolate. After a while there’s more tobacco, honey coated roasted nuts and a light earthy hint. Delicate spices. Beautiful. Mouth: more plums and sherry. Kumquats. Wee touches of herbal liqueurs. Tobacco leaves again. Orange zest and fruit tea. Fades on nice spicy notes (pepper, nutmeg, cinnamon). Elegant and not woody. 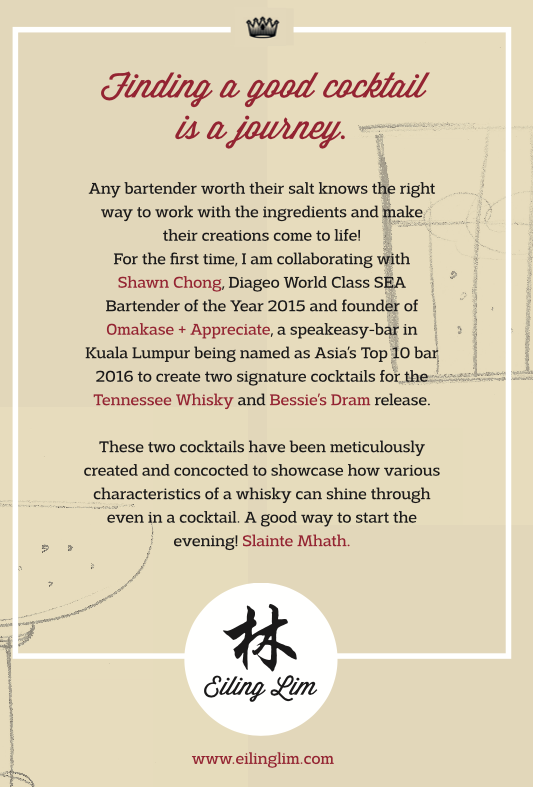 Two cocktails have been specially created for the release of the Tennessee Whisky & Bessie’s Dram. The cocktail recipes come with every bottle purchased. It is with great pleasure to announce another release of a very old whisky in the line-up of my classic label. This is a Scotch single malt whisky distilled in the year 1973 and bottled recently at 47.8% in a fino cask. It will be my 2nd bottling of a 43 year old whisky after bottling a 43-year-old Ben Nevis two years ago. This is an undisclosed distillery bottling which I bought from a whisky broker and no matter what I did or how I begged, no information was spared. However, what we did know is that this is a superb drinking whisky from the region of Speyside. There are probably not so many of these old casks left and I was lucky to come across this particular cask which I jumped onto the opportunity to grab it while I still can. 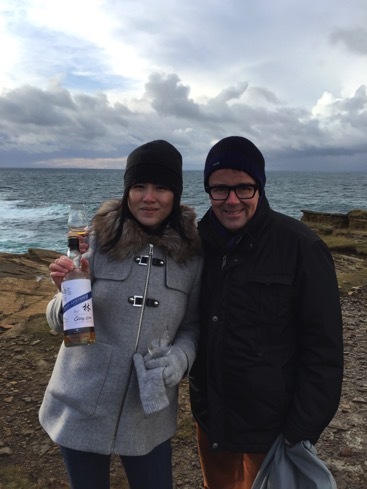 I was really happy to be able to share it first with a group of friends and whisky lovers during our recent trip to Orkney. I remembered opening this bottle first at Dornoch Castle Hotel and then taking some nice shots of it at the Yesnaby cliffs. What a place and company to enjoy a good dram! And in less than a month, my bottle was almost empty! 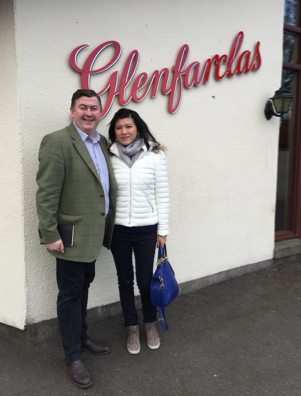 After a long spell of silence, I decided to surprise whisky lovers with yet another exciting whisky from non other than the famous distillery of Glenfarclas at Ballindalloch in the heart of Speyside. To this day, Glenfarclas is one of only a few distilleries in Scotland to remain family owned and managed. The distillery is owned and run by the Grant family and the tradition of producing good whisky continues to the 6th generation now. The distillery has six direct-fired copper stills which are the largest on Speyside. 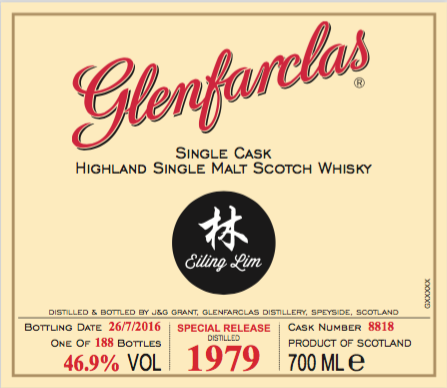 Everyone knows Glenfarclas is renowned for producing Single Highland Malt Scotch Whisky in the traditional Speyside style, with a heavy sherry influence and that is why I would like to surprise whisky lovers to try my atypical cask of Glenfarclas 1979 aged 37 years in a “plain oak” cask #8818. For many who would have already known that the Family Casks range from 1979 are special because they are not matured in sherry casks and they are also known to be extra fruity. 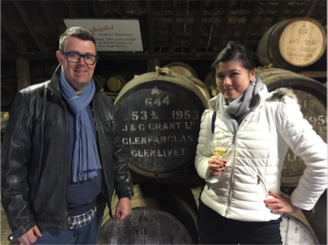 Luc & I were so lucky that we were able to taste so many of the 1979 casks in the dunnage warehouses of Glenfarclas and we found this gem in Warehouse No.8 in 2015. We revisited the distillery in April 2016 and we tasted the whisky again before we decide that this has to be bottled! It is just too good to let go. 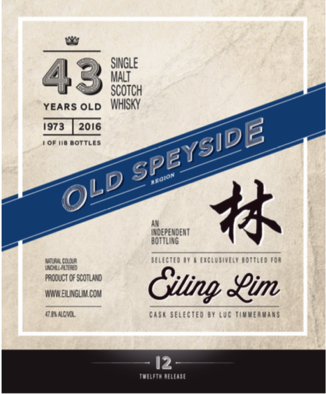 It is an official distillery bottling with a special release for Eiling Lim label. I am so proud and so grateful that I am able to pull this through! As I was writing this, the whisky has been bottled and is expected to arrive at my doorsteps in October. This is a preview of how the label would look like. For all of you whom have supported my whisky range all these while, I would like to be the first one to tell you this great opportunity to buy it at a special pre sale price of €380/bottle. The normal price after 31st October 2016 will be €420/bottle. Since there are only 188 bottles, please do send me an email at info@eilinglim.com if you would like to order the bottle. With so many number “8”s on the label, this is truly an auspicious whisky! Woohoo! We are into 2016 and the first whisky I am launching for the new year shall be from a reputable distillery in Islay. I’m proud to announce my 2nd Islay whisky in the range will be Caol Ila. It might be a young whisky but the taste will do its talking. Nose: Minerals, green apples, smoked fish, salty sea breeze, dry seaweed, zest of calamansi, quite medicinal with a farmy note. On the Palate: Starts oily, licorice, sea saltiness, white pepper, long lingering chewy finish. The whisky is pure that you could define the taste without any wood that masks the whisky. This whisky is definitely a winner and beats many other older whisky.